Abidjan seems to have many; Grand Bassam has one for sure, maybe more, hard to say. I need to load up on CFA. There is no French Franc now, I am not sure if this money is pegged or connected with the Euro, however the money is good and bad. I am sad if France is still holding them by their money. I need CFA, I need to load up, and I have one person who told me or acted as if the countries of Togo and Benin are barren. My Lonely Planet is 7 years old, hard to say if the new one talks about ATM’s. The world of travelers check should be disappearing. I would be somewhat stupid to get travelers checks, there needs to be a bank to cash a traveler’s check, or I would guess. I am in a place where CFA is king. I have not seen in Aboisso a place to exchange money. There is a Western Union here, however there is no internet. IF I had the internet, I think it is possible to wire myself money, and then pick up here. It may be a lot quicker to load up on CFA in this manner. However, I have never wired myself money and do not know if it is safe. I mean, it could be hung up in the Western Union office as they could say, it is not available, or even they do not have that much money available. I will try to remember to ask the Western Union office in broken French. Bonoua is suppose to have internet, that means if Bonoua does have internet I could go to the Western Union site, and send myself money. I think this is a lot safer than getting a cash advance at a bank. I could then pick up the money even in Aboisso, or maybe Noe. Noe appears to be the border town of record with the Gare or Bus stations, and all the transportation. However, Noe is not in the guidebook or my Encarta Encyclopedia map. Annoying when the prominent city on the FEET is not mapped or shown as being big enough to be listed. There is a Club Med in Assine or something like that directly South of my present location. I am tempted to go down just to see if they have anything of interest, ATM, Banks, Internet, good beaches or are they barren like the Grand Bassam. I am searching for an ATM; however, the daily limit is about 150,000 CFA if I remember correct. This is 300 U.S. and I need to sit for 3 days to get 900, which would get me through Benin and Togo. I have Euros and Dollars, however how to I exchange. Noe is a border town; I wish the tourism part of the world would get their show together and understand. Borders or Entrances to countries need ATM, Bank Machines. Cajero Automaticas or what not. I fly into Abidjan and there is not a bank machine in the Airport, there is many persons who wish to give me the business by exchange, there is a bank, but no bank machine. It was the same in the Domestic Airport of Delhi, I am not sure, you have inside and outside the terminal there. Travel Infrastructure is asinine, just does not understand. There was ATMs 7 years ago when the book was written. Guides are written for tourist on a 2-week vacation. Otherwise, they would be mapping out the money routes, or where you can get money better, or learn, traveler’s checks are out and ATMs are in. 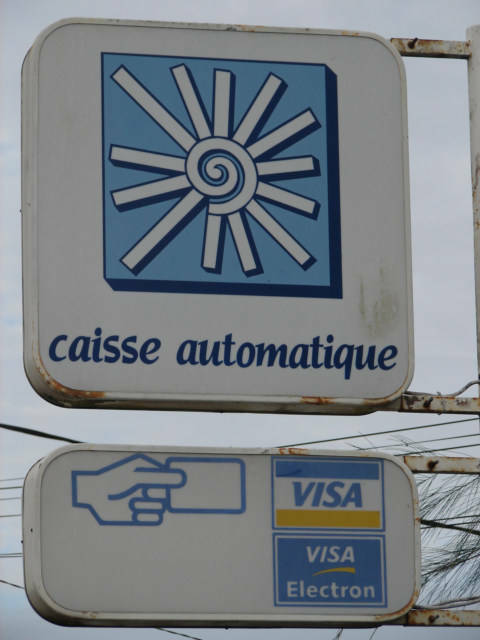 Caisse Automatique Visa or Visa Electron is what it says on ATMs or Bank Machines in Grand Bassam. I have a Visa with Plus on the back and a cirrus on back. I am not sure, how mine worked or why. I have a plus ATM card and used it less than two months ago, in December 2010.